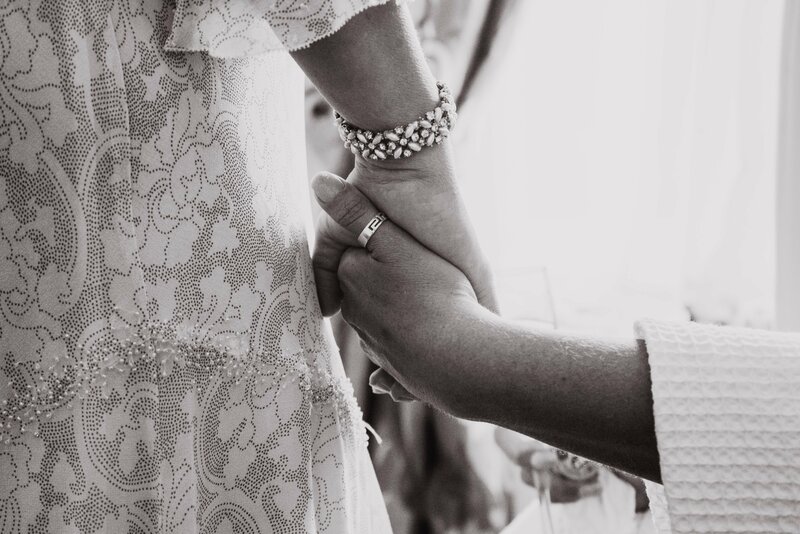 May 29, 2017 / STORIES OF "I DO"
Dimple Well Lodge near Wakefield was the perfect setting. Dimple Well allows brides and grooms to have both wedding and reception in the venue. This West Yorkshire country hotel, is an 18th century Victorian house with landscaped gardens. 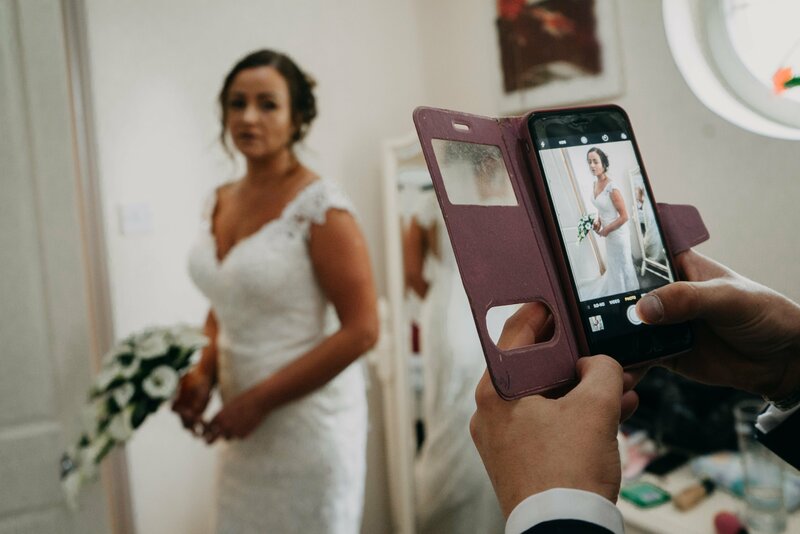 It was a perfect backdrop for wedding photographs of the happy couple’s special day. 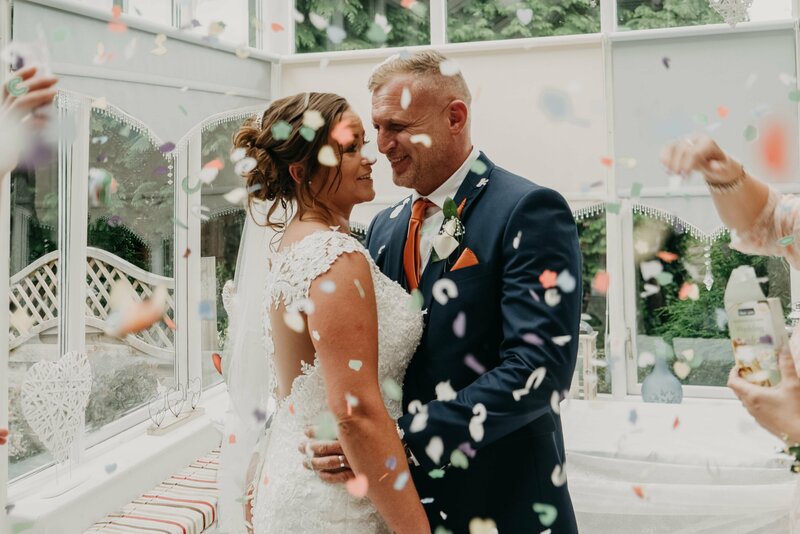 Stories Of I Do, Leeds Wedding Photographers had the honour of photographing this Dimple Well Lodge Wedding. 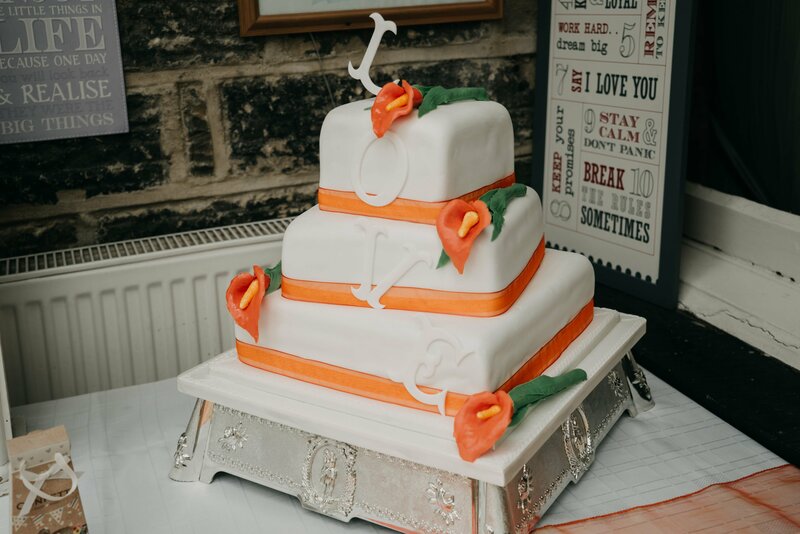 You might have seen our sneak peek for Rachel & Tony from a few weeks ago. 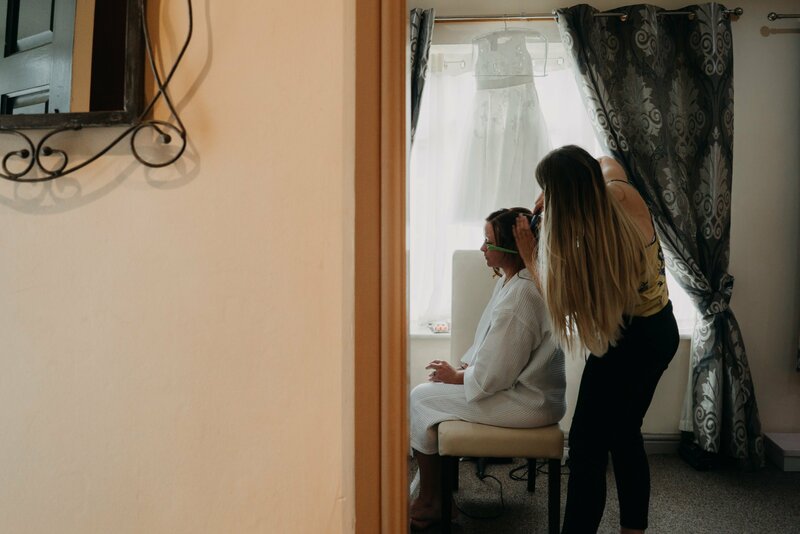 Our bride Rachel chose to get ready in the lovely onsite cottage at Dimple Well. The happy couple had also chosen to stay here for their wedding night. 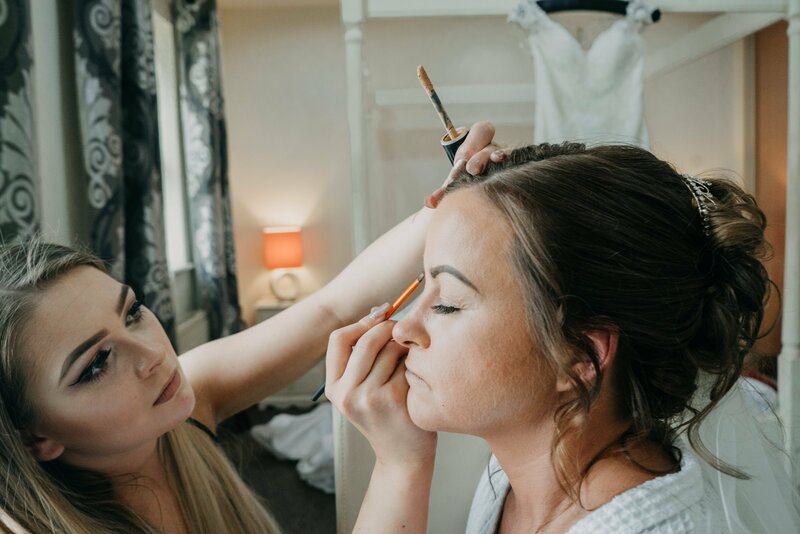 Her hair and make-up artist professionally helped Rachel to look elegant and beautiful. 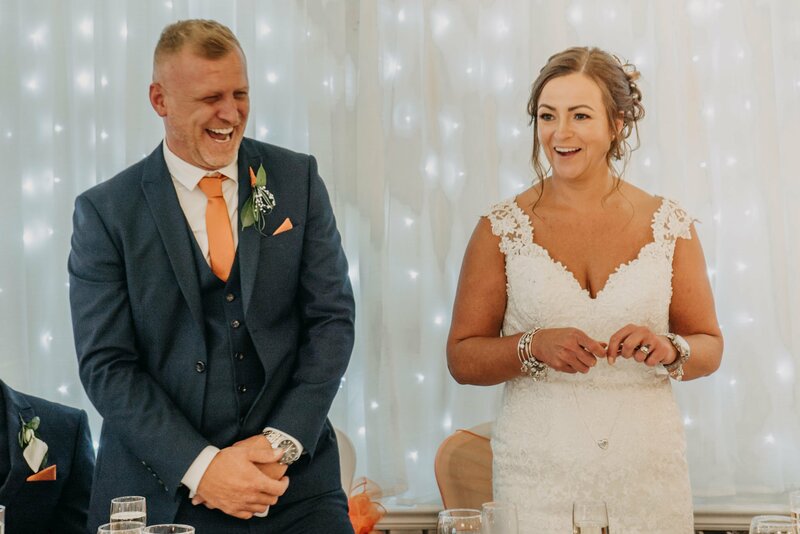 We captured images to treasure o f a wedding morning full of smiles and laughter. The bridal party also included Rachel’s son who was giving her away. One of her daughter was a flower girl. Standing nervously in front of a full length mirror Rachel looked perfect. 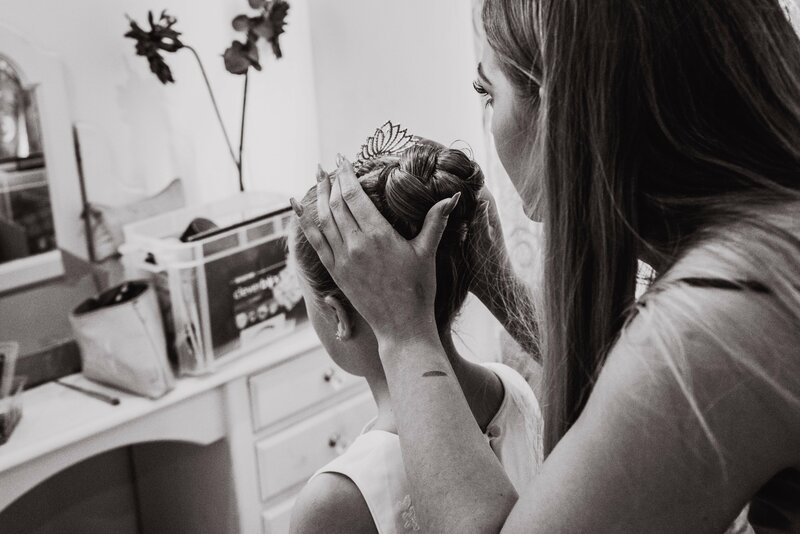 Her hair was styled up elegantly, with a mid-length veil pinned at the back. 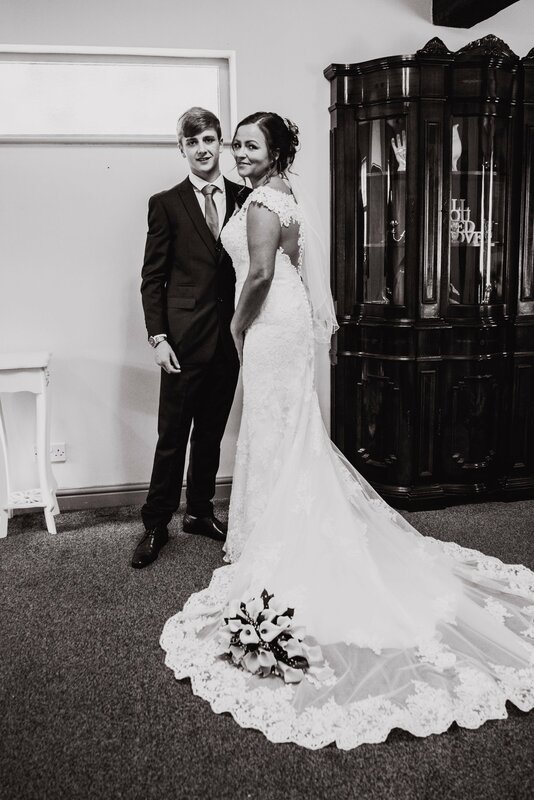 An image of loveliness, she wore a stunning white lace wedding dress with a long train. 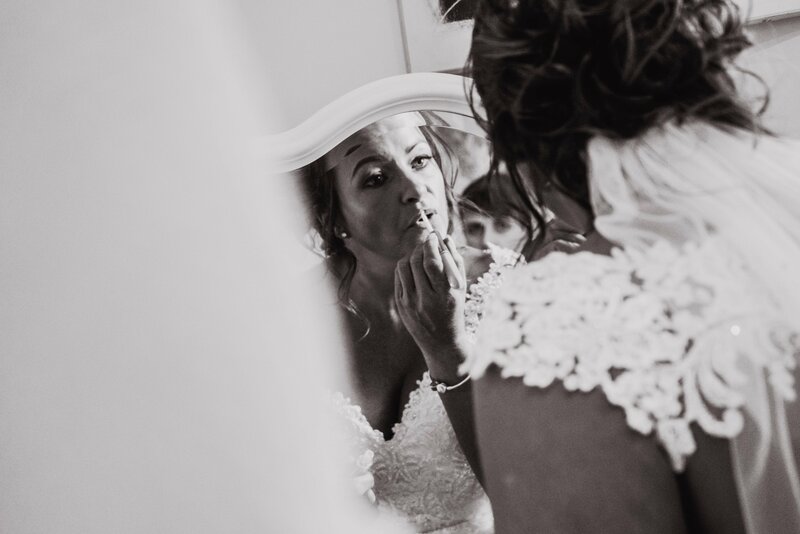 Her trailing bouquet of white calla lilies added to the breath-taking beauty of the bride. 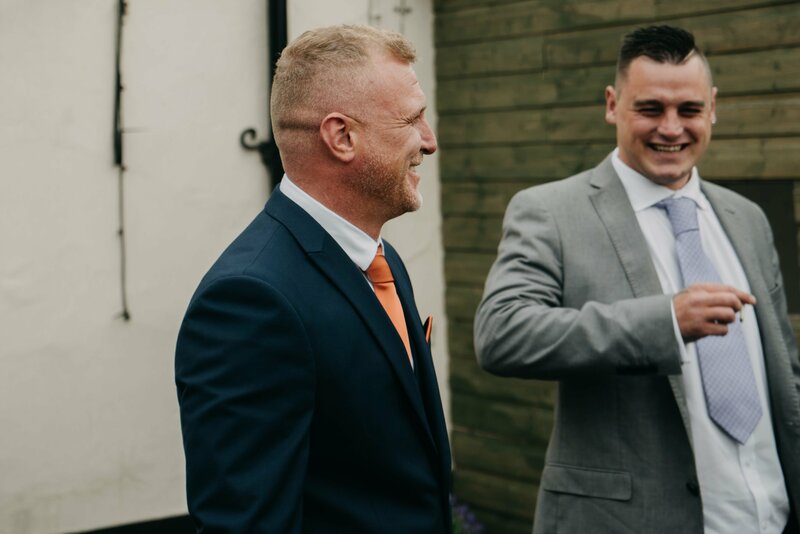 Jon met the groom for his pre-wedding preparation in one of the local pubs. The groom and groomsmen – including two best men, wore calla lily button holes to match the bride’s bouquet. 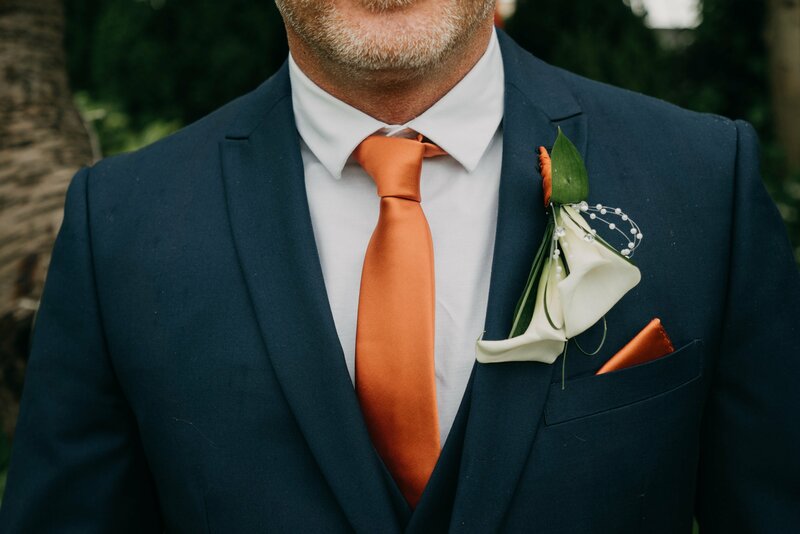 Touches of a pale orange in the buttonholes matched their ties and pocket squares. 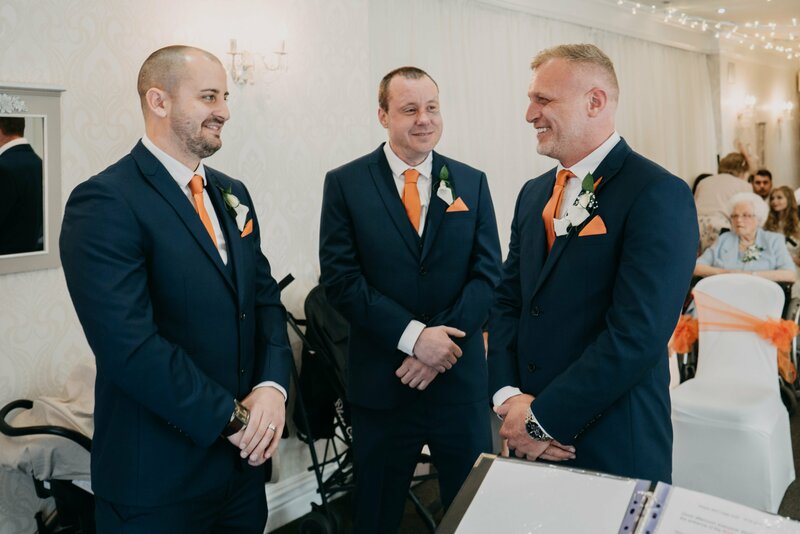 As friends and family arrived the best men helped Tony check that everything was in place and the wedding began. 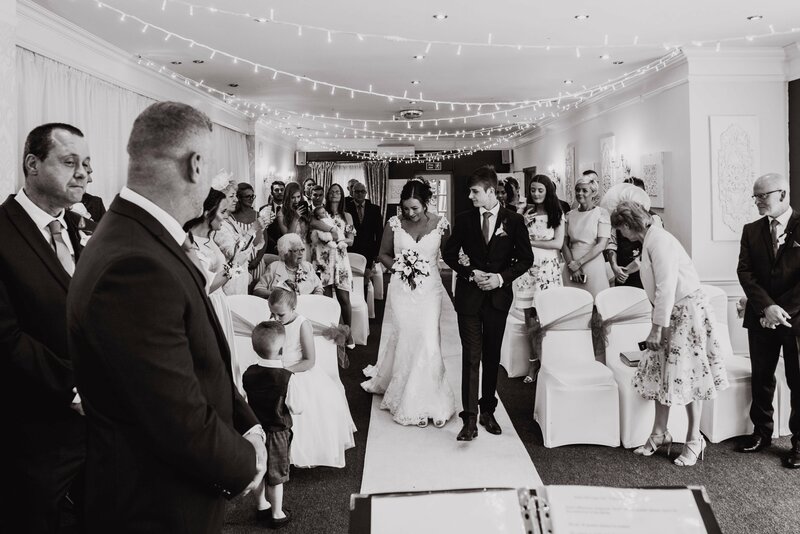 As Rachel walked down the aisle at Dimple Well Lodge her nerves melted away and she looked radiant. 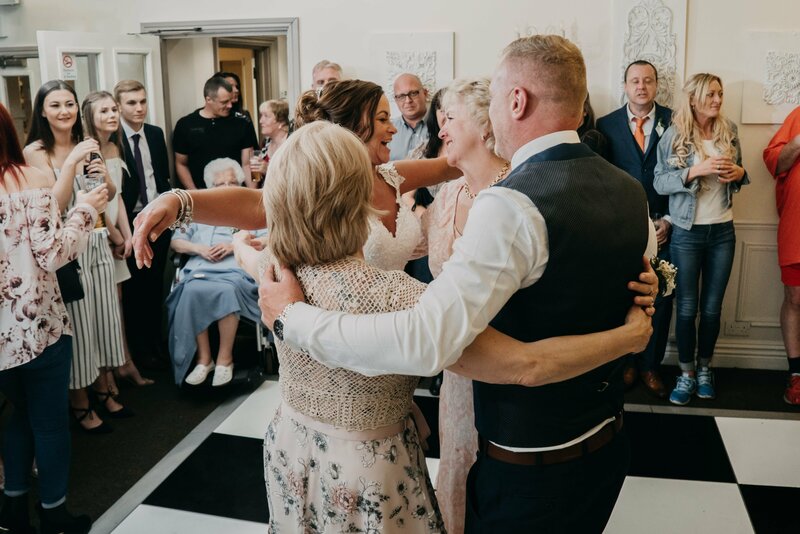 Her son was clearly very proud as he escorted his beautiful mum to stand by her future husband. 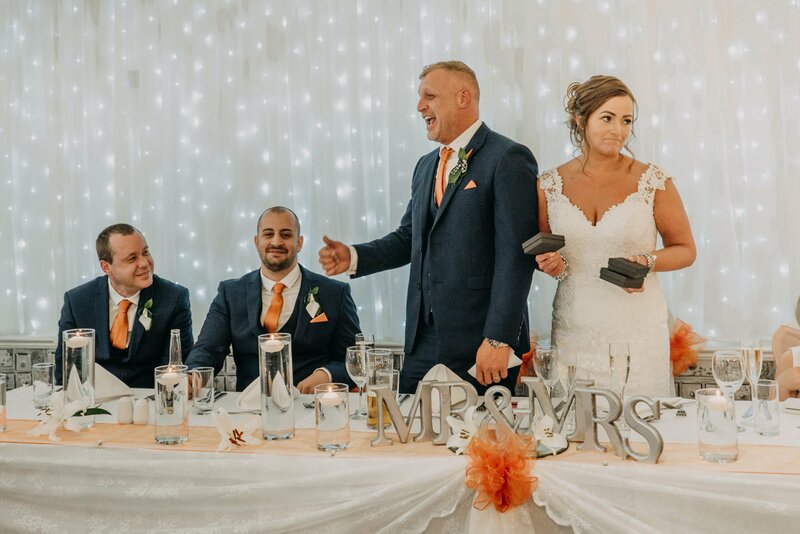 All their guests were beaming as they witnessed this lovely couple make their marriage vows. During the wedding ceremony Tony and Rachel only had eyes for each other. 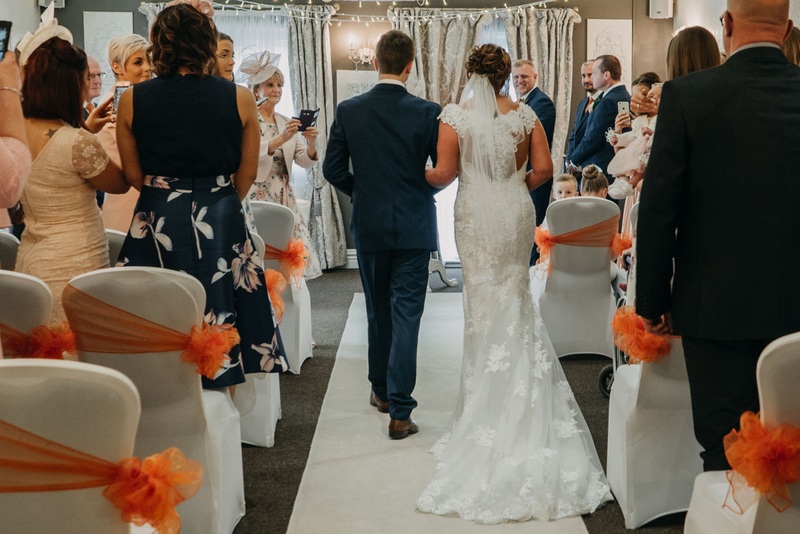 Dimple Well Lodge Wakefield was full of pretty little details for a dream wedding. 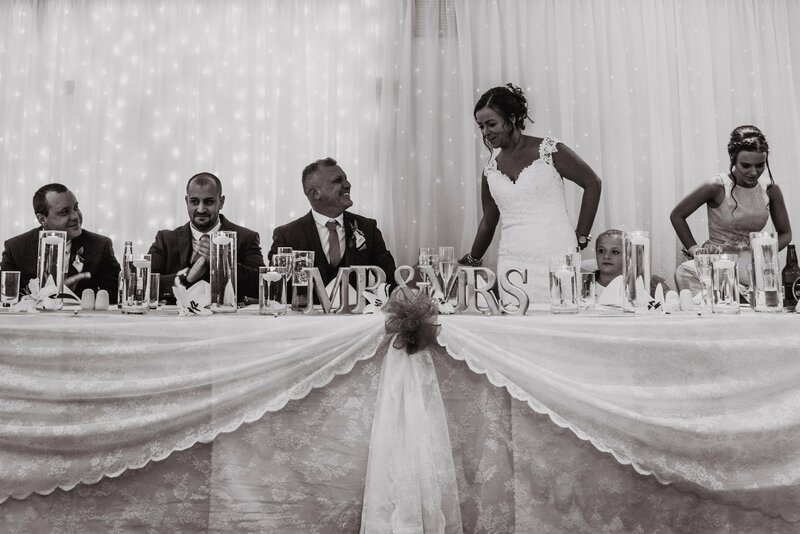 Hanging hearts, pretty signs and twinkling fairy lights provided lots of opportunities for romantic photographs. 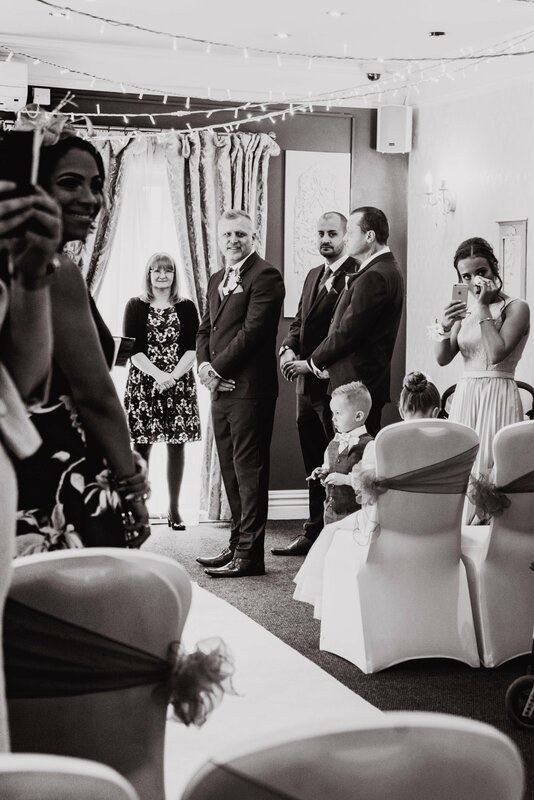 The guests were clearly delighted by this day full of joy. Family and friends all showered Rachel and Tony with congratulations, laughter and confetti. 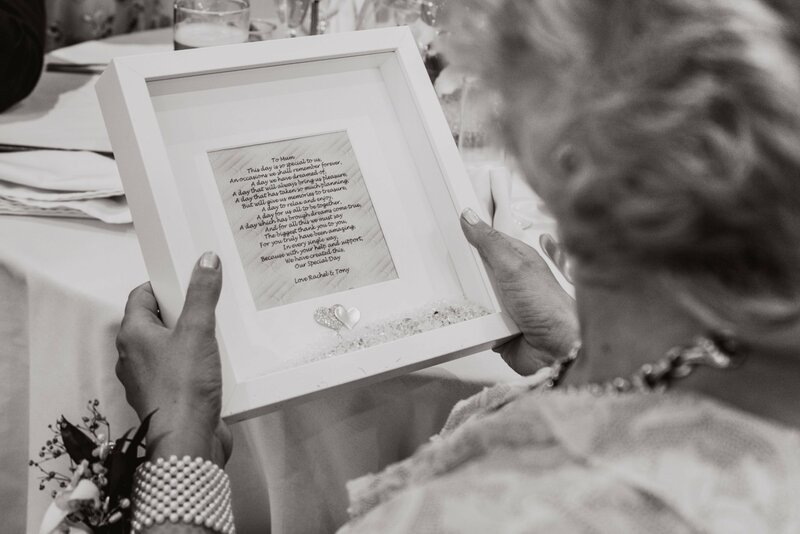 Creating some beautiful photographic moments and images to treasure forever. 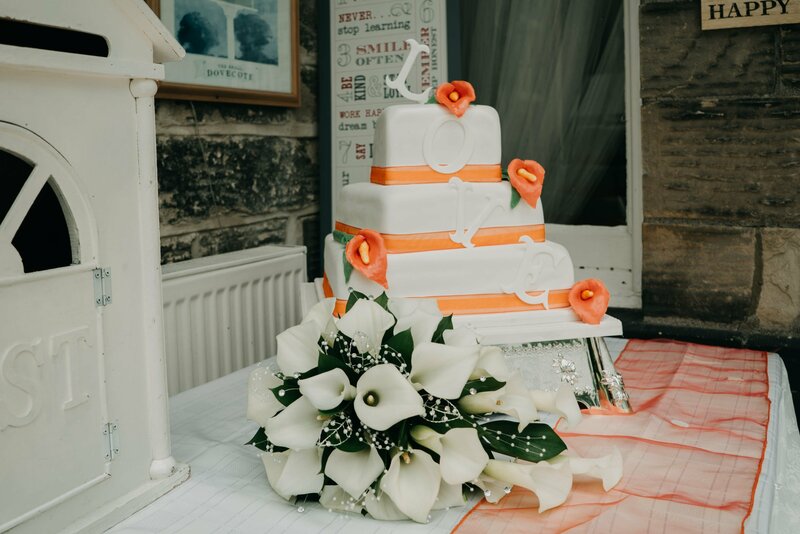 Their elegant, three tiered wedding cake was white with pale orange calla lilies and ribbons to match the groom and groomsmen’s wedding accessories. The word ‘love’ elegantly cascaded down the tiers. 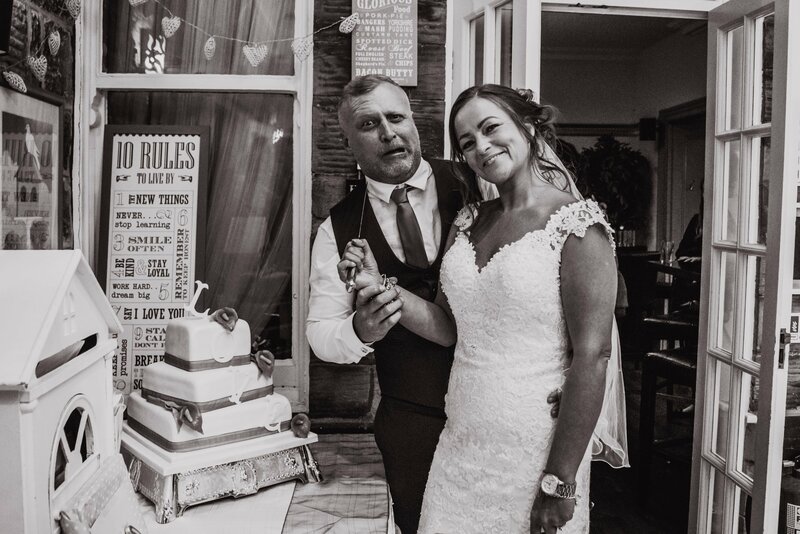 When it was time to cut the wedding cake Dimple Well Lodge filled with laughter, as Rachel pretended to use the knife on her new husband! 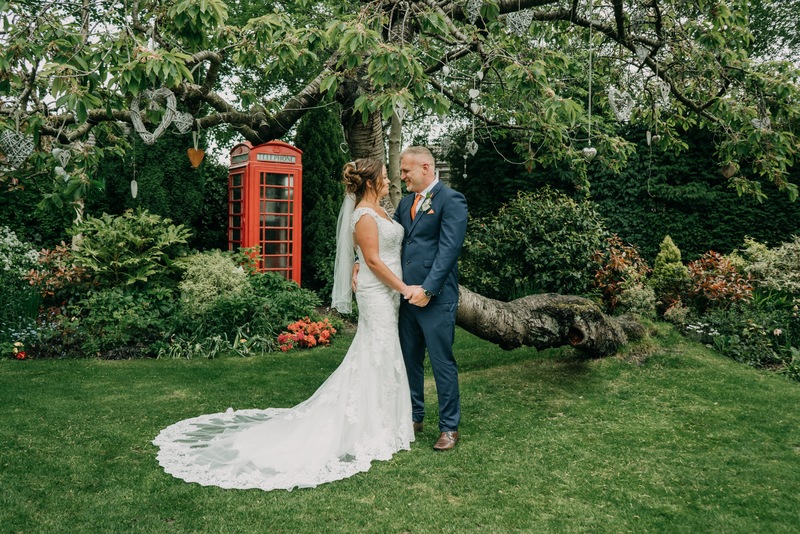 Outside the pretty gardens of the lodge were a wedding photographer’s delight. 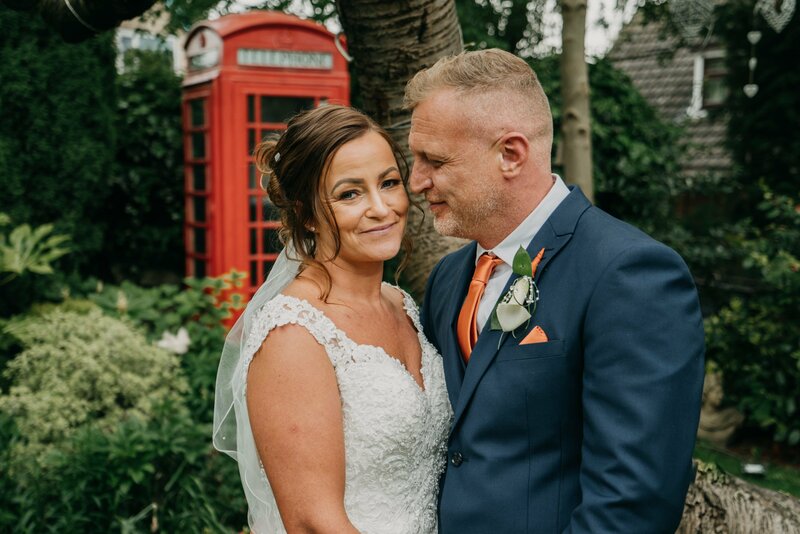 A fallen tree was strung with hanging hearts and an old fashioned red telephone box was a quirky opportunity for some portrait shots. 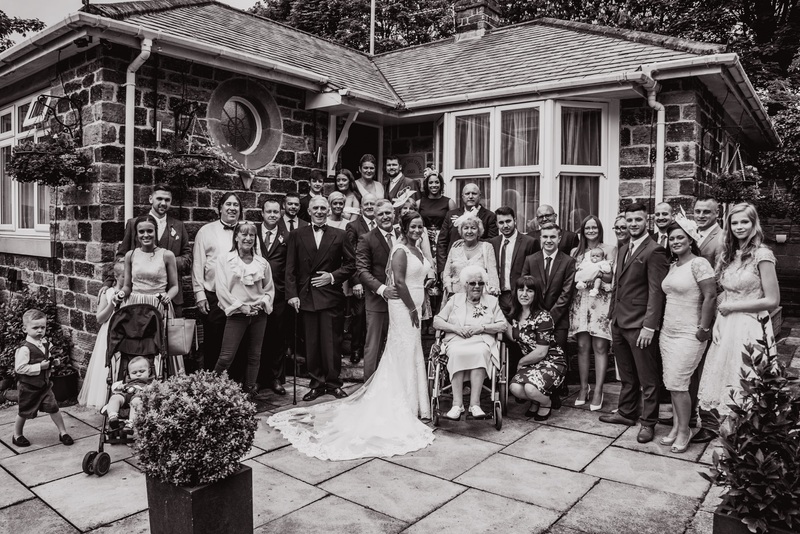 The whole wedding party and guests posed for photographs in front of the Dimple Well Lodge cottage. 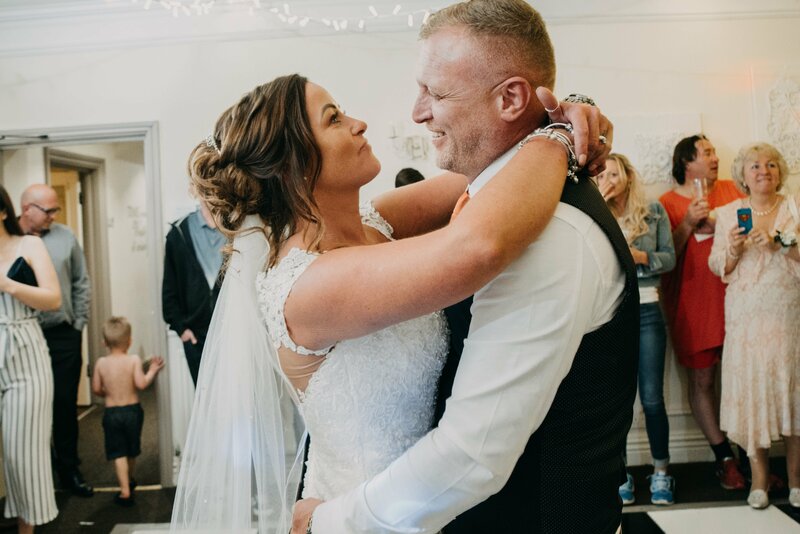 Rachel, in her stunning wedding dress and train, and with a joyful smile, was a picture perfect bride. 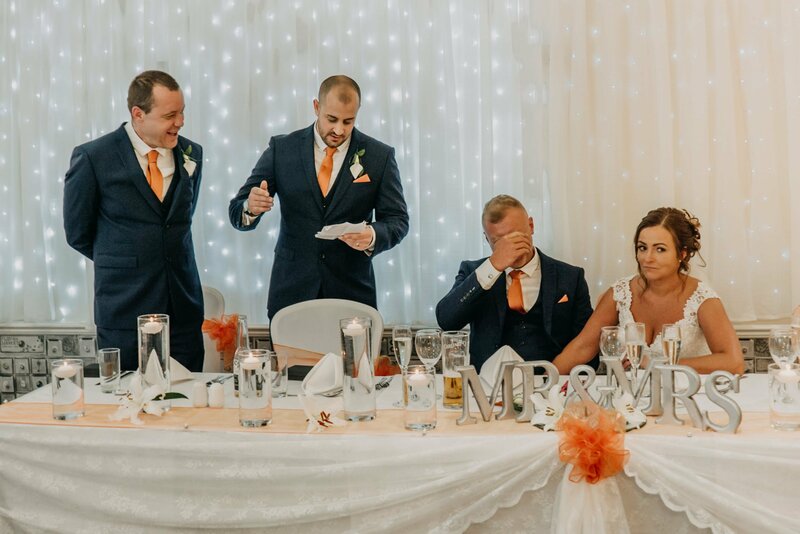 This photographic wedding also included some entertaining shots of the self-conscious groom. 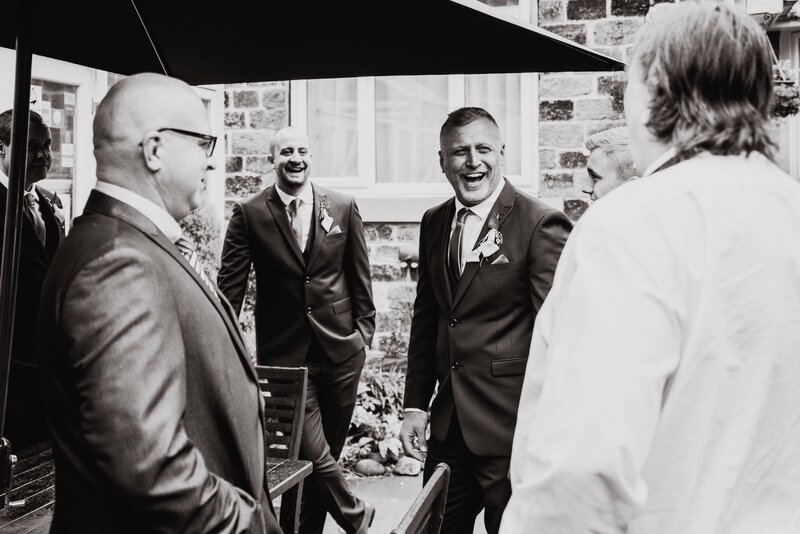 From an image of delight at his first sight of his stunning bride, to his embarrassment at the stories told in the best men’s speeches. 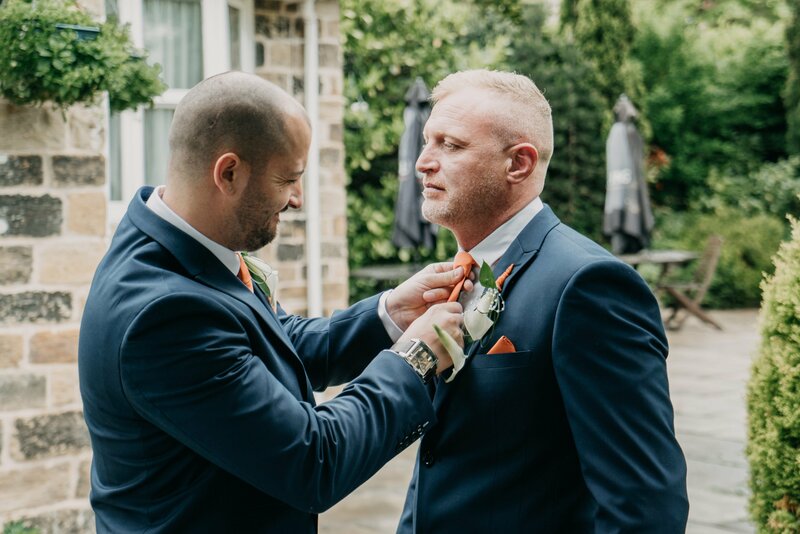 The wedding photography captured the groom’s day too. 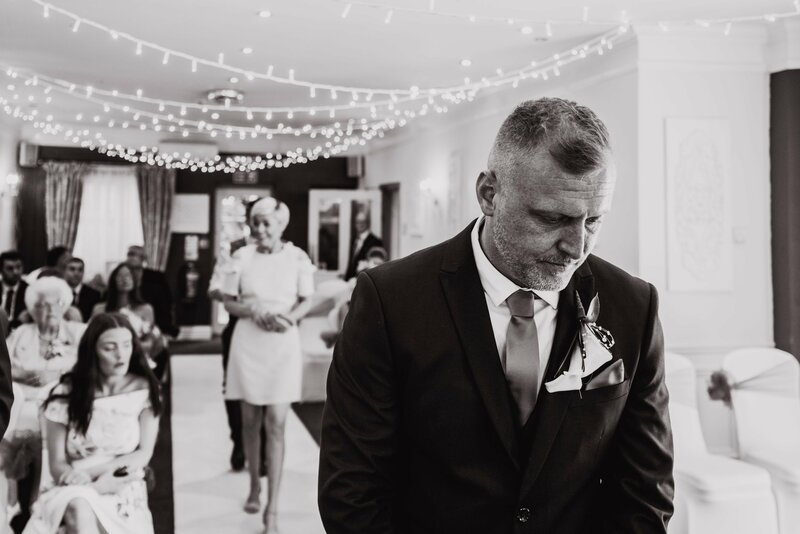 With everything going to plan our couple relaxed .. As the happy day turned into evening the fairy lights came on and the dancing began. 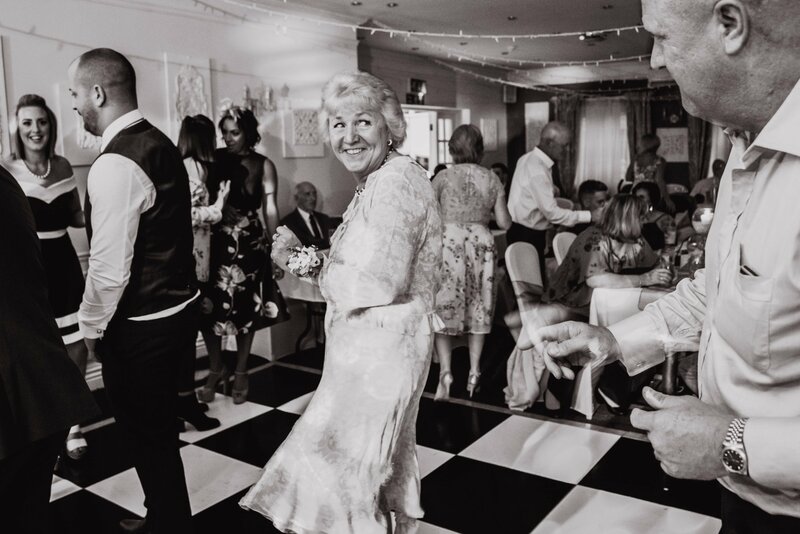 With Dimple Well Lodge’s DJ providing the music, the newlyweds took to the dance floor. 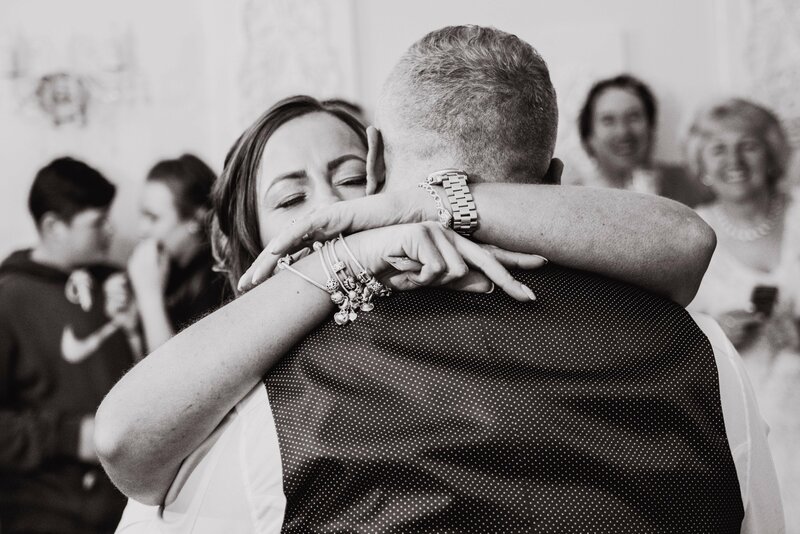 Rachel and Tony, our joyful Mr and Mrs, gazed into each other’s eyes for their first dance as husband and wife. 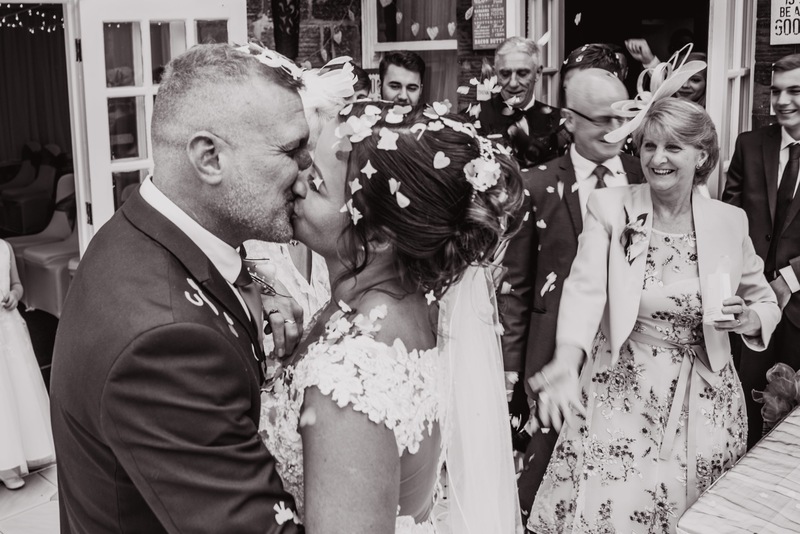 Thorner Leeds Wedding Photographer | David + Louise – Sneak Peek STORIES OF "I DO" Sneak Peek – Sheryl & Sam Mythe Barn Wedding Ceremony STORIES OF "I DO" Sneak Peek – Lizzie & Dave | Belper Wedding Photographers STORIES OF "I DO"